Dr J Arjuna Ratnayaka is a Lecturer in Vision Sciences (School of Medicine) at the University of Southampton. Dr Ratnayaka brings together expertise in Retinal biology and Neurodegeneration. 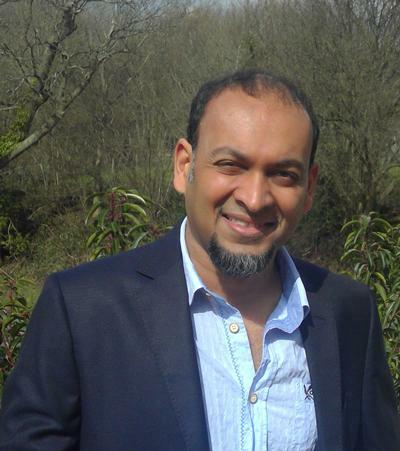 After graduating from the University of Aberdeen, Dr Ratnayaka completed a Master’s degree at Imperial College, London, followed by a PhD from the University of Liverpool. His doctoral work characterised the molecular/biochemical fate of proteins associated with Age-related Macular Degeneration (AMD) and proliferative vitreoretinopathy. He extended his interests in degenerative pathophysiology in two successive research groups at King’s College London and at the University of Sussex where his postdoctoral work investigated axonal and synaptic mechanisms in the central nervous system. Dr Ratnayaka’s work helped unravel the molecular pathways of neurotransmission by describing how synaptic vesicles are shared by adjacent synapses, how signalling occurs via extra-synaptic sites and by uncovering new mechanisms modulating synaptic plasticity. His group at Southampton studies molecular mechanisms underlying degenerative pathophysiology in the senescent retina and brain. His core team comprises of technical and postdoctoral staff as well as PhD students. Their work utilises in-vitro and animal models as well as human donor tissues, and employs histological, molecular/biochemical, light and ultrastructural microscopy as well as 3D imaging techniques. Dr Ratnayaka’s work involves collaborations with other scientists and clinicians as well as industrial partners. His portfolio includes teaching and mentoring activities across two Schools. The senescent retina is affected by a variety of common as well as rare diseases that often leads to irreversible sight loss. Examples include Sorsby Fundus Dystrophy (SFD) and Retinitis Pigmentosa which are caused by single genetic defects, whilst others such as Age-related Macular Degeneration (AMD) are caused by genetic as well as exogenous risks. Examples of non-genetic/exogenous risks include a high fat cholesterol-enriched diet, metabolic disorders and obesity. AMD for instance, has a complex aetiology, and is poorly defined at molecular level. Even SFD, the aetiology of which is considered to be less complex, is still incompletely understood. We use a combination of in-vitro systems, mouse models and donor human tissues to study how retinopathies are triggered and develop at the level of single cells and tissues. Our work employs a combination of molecular and cell biology, biochemistry and histological techniques as well as confocal and transmission electron microscopy with 3D imaging. Insights from this work will help define retinal diseases in novel molecular terms, and help identify new targets for future treatments. Advances in electrospinning, laser and 3D printing techniques has ushered in the possibility of synthesising designer artificial scaffolds which mimic biological membranes with great accuracy. These new materials are highly versatile and can be used for a range of biological, medical and industrial applications. In collaboration with Professor Andrew Lotery, we have developed an artificial Bruch’s membrane on which Retinal Pigment Epithelial (RPE) cells can easily be grown for transplantation. The efficacy of these new scaffolds are tested in long-term cultures and transplanted into animal models with the aim of providing rapid therapeutic benefit to patients with blinding diseases. 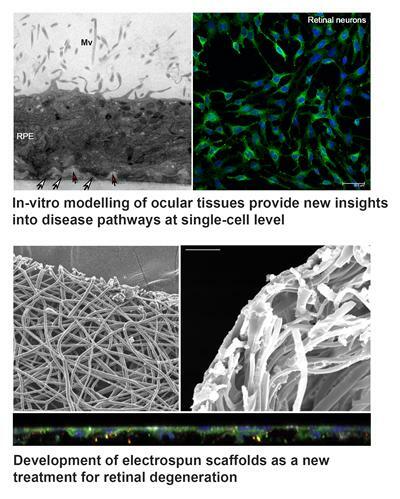 From the genetics that underpin ocular diseases to obtaining novel functional insights in cells. The genetic architecture of many ocular pathologies have been identified in the last few years. These discoveries however have not translated to understanding what actual molecular changes occur in disease. In collaboration with Professor Andrew Lotery, Dr James Self and Dr Helena Lee, this project aims to identify how genetic mutations underlying ocular diseases such as Age-related Macular Degeneration, rod/cone dystrophies, albinism and nystagmus causes change at the level of single cells and tissues. We aim to translate recent advances made in the field of genetics to cell biology, so that functional consequences of mutations and genetic variations can be better understood to develop more effective treatments. The role of an individuals’ diet, metabolic activity and body mass has been shown to contribute to the risk of developing disease in later life. Growing evidence suggests that an unhealthy diet comprising of high fat and cholesterol-enriched food (often referred to as a “Western-style” diet) can switch an ageing, but heathy retina, to a diseased phenotype. We use a combination of in-vitro systems and mouse models to identify molecular mechanisms underpinning these changes. This project aims to discover novel disease-causing pathways in the retina driven by diet alone; a single risk factor that can be altered through choice of better foods and lifestyle. Biomarkers offer the possibility of identifying pre-symptomatic individuals at risk of developing disease. Taking advantage of our considerable clinical resources at Southampton, this study aims to identify novel biomarkers of AMD and other retinopathies. Our ultimate goal is to help establish potential new links between molecular pathology in the eye with changes that can easily be detected in the rest of the body. 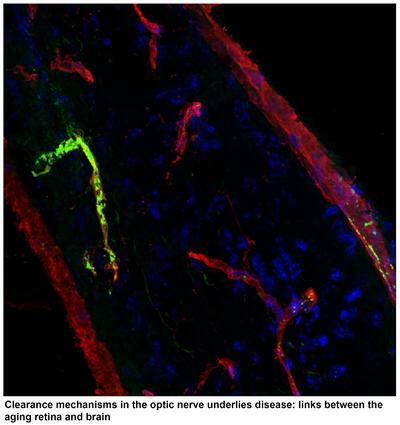 Degenerative disorders of the senescent retina and brain share remarkable similarities including impaired mitochondria and lysosomes, trafficking defects and the involvement of misfolding proteins like Amyloid beta (Ab). Patients with neurological disorders such as Alzheimer’s and dementia also suffer from a wide range of visual defects. Whether diseases in the retina and brain are linked, and if so to what extent, is still poorly understood. Advances in non-invasive scanning methods such as optical coherence tomography (OCT) means that neurological changes can be detected easily through retinal imaging. 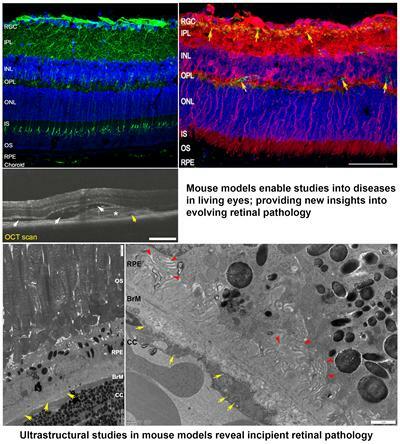 Using OCT and other imaging modalities, we use animal models of retinal degeneration and Alzheimer’s disease (AD) to shed light into the shared pathobiology of the senescent eye and brain. Our discoveries may help uncover new mechanisms underlying AD/dementia and complex retinopathies such as AMD. 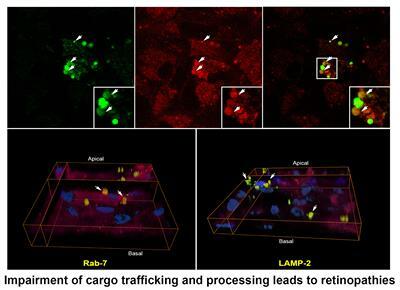 We have recently extended these approaches to studying the developing retina to gain novel insights into conditions such as albinism and related pigmentary disorders. Research Opportunities: Inquiries are welcome from scientists, clinicians and potential industrial partners to work on existing or new projects utilizing expertise developed in our laboratory. Interlinking research themes spanning diseases of the eye and brain helps study ocular and brain disorders from a novel and a more cohesive perspective. The group consists of technicians, PhD students and postdocs, as well as short-term project students and summer interns. Inquiries are welcome from prospective postdoctoral fellows. I also welcome queries from independently funded non-UK/EU students interested in undertaking work leading to a PhD. Undergraduate and postgraduate students from the University of Southampton interested in short-term projects are also encouraged to contact me in the first instance. Keeling, E., Johnston, D., Chatelet, D., Tumbarello, D., Lotery, A., & Ratnayaka, J. A. (2018). Lysosomal impairment in the Retinal Pigment Epithelium (RPE) - a pathway of damage in the ageing retina. Investigative Ophthalmology & Visual Science, 59 , 4487. Norman, C. S., O'Gorman, L., Gibson, J., Pengelly, R. J., Baralle, D., Ratnayaka, J. A., ... Self, J. E. (2018). The contribution of common population variants to hypomorphic oculocutaneous albinism phenotypes: a novel tri-allelic TYR genotype. Investigative Ophthamology & Visual Science, 59(9), 5784. Lynn, S., Goverdhan, S., Munday, R., Scott, J., Freeman, T., Johnston, D., ... Ratnayaka, J. A. (2016). 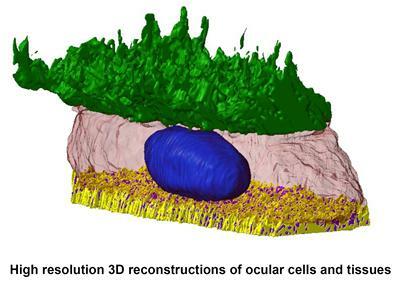 A mouse model to study Aβ-driven pathology in the ageing retina. Investigative Ophthalmology & Visual Science, 57(12), 6534. Lotery, A., Ward, G., Alexander, P., Johnston, D., Page, A., Cree, A., ... Ratnayaka, J. A. (2016). A novel biosynthetic RPE-BrM (Retinal Pigment Epithelium-Bruch's Membrane) assembly suitable for retinal transplantation therapy. Investigative Ophthalmology & Visual Science, 57(12). Ratnayaka, J. A., Lynn, S. A., Griffiths, H., Scott, J., Cree, A., & Lotery, A. J. (2015). An ex-vivo platform for manipulation and study of Retinal Pigment Epithelial (RPE) cells in long-term culture. Investigative Ophthalmology & Visual Science, 56(7), 2332. Ward, G., Thomson, H., Alexander, P., Ratnayaka, J. A., Treharne, A., Attard, G., ... Lotery, A. (2014). Development of a novel bio-compatible polymer film for use as a Bruch’s membrane substitute. Investigative Ophthalmology & Visual Science, 55(13), 2997. Paraoan, L., Ratnayaka, J. A., Spiller, D. M., White, M. R. H., Hiscott, P., & Grierson, I. (2009). Molecular mechanisms governing impaired secretion of the AMD-associated variant B precursor cystatin C in RPE cells. Investigative Ophthalmology & Visual Science, 50(13), 2345. Ratnayaka, J. A., Paraoan, L., Hiscott, P., Spiller, D. G., White, M. R. H., & Grierson, I. (2005). Precursor cystatin C Ala25Ser variant displays an intermediary phenotype between wild–type and AMD–associated cystatin C. Investigative Ophthalmology & Visual Science, 46(13), 1753.